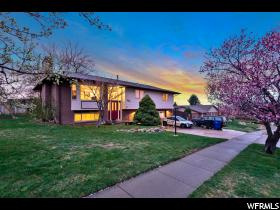 All VIEWCREST PARK homes currently listed for sale in Cottonwood Heights as of 04/26/2019 are shown below. You can change the search criteria at any time by pressing the 'Change Search' button below. "***OPEN HOUSE Sat. April 27th 1-2 p.m.*** UPDATED home w/BEAUTIFUL valley & mountain views. REMODELED kitchen w/QUARTZ counters, back splash, stainless steel DOUBLE ovens. Brazilian hardwood flooring, bamboo, new porcelain tile! CUSTOM can lighting throughout upstairs. NEW ROOF (2017) w/40 year warranty (transferable!). NEW HIGH EFFICIENCY furnace (95%!) & A/C unit (2017). NEW paint. UPDATED bathrooms. 2 COZY fireplaces (1 gas, 1 wood). Water conditioning system! Kitchen is wired for toe kick & under cabinet lighting on a motion sensor. NEW breaker panel (approx. 2012); custom sub-panel so whole home can be connected to a generator backup. Nearly every light switch & outlet have been updated. Additional power added in garage. NEW paint on front of home. PEACEFUL, fully fenced backyard w/fish pond & VIEWS. ONLY STEPS AWAY from CRESTWOOD PARK, its trails (runners/bikers! ), AND Anzark park (tennis)! CONVENIENTLY located in Cottonwood Heights close to I-215, shopping, canyons, skiing! SQ FT per county records. Buyer/agent to verify all. "